Last month we told you about the impending retirement of Tom Priddy, the postmaster of Bedford, Indiana. According to the story in the local newspaper, Tom was the “last politically appointed postmaster in the country”. Recently, however, a reader pointed out that the US Postal Service’s list of “longest serving postmasters”, includes one who was appointed in 1949, and is apparently still on the job. So while Edgar wasn’t appointed by the President, he, like any other postmaster at the time, would have been considered a political appointee. Edgar Kumley does not know exactly when he was born — the hospital records were lost in a fire decades ago — but he knows it was when Woodrow Wilson was in the White House, in 1919 or 1920. When Kumley was barely three years old his father, Earl, was appointed postmaster of the Redig, South Dakota, Post Office. During the Great Depression, the elder Kumley went to work for the Resettlement Administration and Edgar’s mother, Ella, was appointed postmaster. Kumley remembers entire families during the Dust Bowl, walking westward across the prairie while carrying all their possessions. “We would take them in and feed them, and the next morning they were on their way again across the gumbo,” he recalled. In 1948, while Harry Truman was president, Edgar Kumley became the acting postmaster of Redig; he was appointed postmaster on March 25, 1949. And there he remains, with more than six decades on the job. 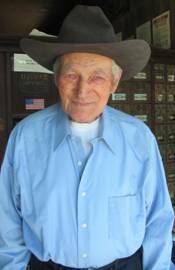 For 102 years there has been a Post Office in Redig, and for 89 of those years there has been a Kumley behind the counter. Although it isn’t mentioned in the USPS bio, you were likely to see a Kumley behind the counter even when Edgar wasn’t there- his wife Elizabeth, who passed away in 2009, was, according to her obituary, the “assistant postmaster”. (I suspect that means she was a PMR). So it looks like we have new contender for the “last politically appointed postmaster”. If you know of another possible candidate, let us know in the comments! Tomorrow January 31, 2018 i am conducting the retirement ceremony for Samuel J. Mitchell, Postmaster Philo, Oh 43771. He was appointed by Lyndon B Johnson on August 25, 1967.